Truly elegant on any frame or other work of art. Brass Prestige Plates measure 3-1/4"W x 1"H. Black face with gold rimmed border. Lettering engraves gold in color. Brass Prestige Art Nameplates are die cut, including holes for attaching with screws. Brass colored BRADS are included free! It's easy to customize your art name plate order! Simply make your choices and type in the information you desire to be engraved on your Brass Nameplate in the information boxes below. 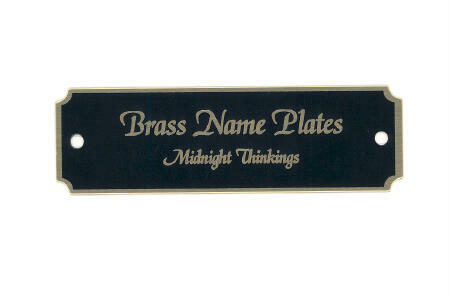 Order 12 or more of the same (identical) brass nameplate and receive a 5% Discount! This product was added to our catalog on Tuesday 06 July, 2004.